Moneta Musings: Today's Nickel is really a Dollar with all the debasement deducted. Today's Nickel is really a Dollar with all the debasement deducted. I always find that it is helpful to look at multiple time frames to validate a short term trend. So I have put together a couple charts below of the US Dollar as represented by the DXY index. It is my belief that the Dollar is even weaker than what these charts reflect as it is benefiting from the turmoil in Europe. The DXY is far from perfect as an index as roughly 50% of the measurement is the Dollar vs the Euro, where as there are other currecnies around the world that are doing substancially better than the Euro, take the Swis Franc for instance. While other currencies are represented in the DXY their proportions are small and don't have as much of an impact as the Euro. Well the DXY is still the index that most traders refer to so we need to be coginzant of what is going on there as when it falls equities and Precious metals tend to do well vs a rise tends to impact those markets. The coorelation between the DXY and the Precious Metals and Equity markets are not cast in stone in fact there were periods in the last decade where all items rose in tandem confounding many. 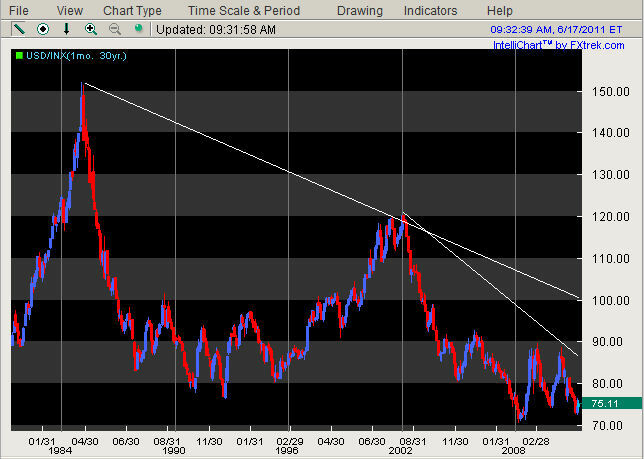 The down trend line for the dollar is also appearent on a 6 month chart using bars that each represent 1 days trading. Currently the DXY has poked its head above the down trend line and has subsequently played cat and mouse with it. Here is the DXY in terms of a longer 3 year view and you can see the support level lines on the bottom of the chart that must hold to prevent large decline in the DXY. Moreover note the down trendline from the Dollar's last peak in June of 2010. 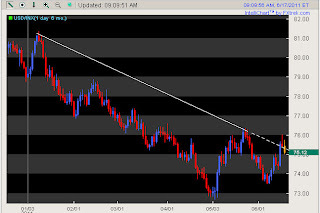 Additionally, you can see the up trend rally which culminated in June 2010 is a different breed of rally then what we are wittnesing today in the DXY. 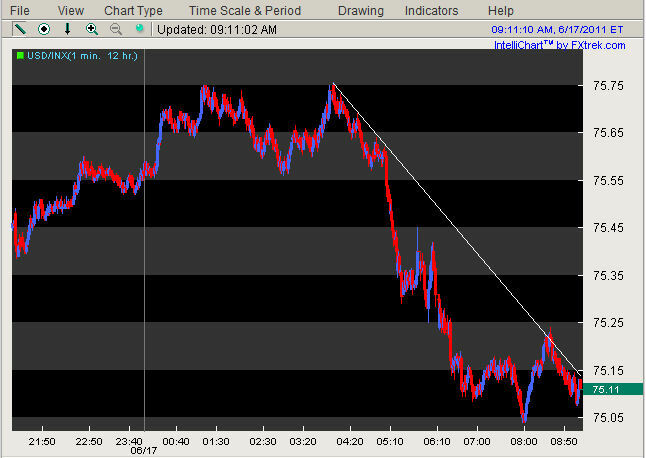 Today's supposed dollar rally appears to both lack conviction and be in much more compressed time frame. This last chart is just to give you a grand sense of the Dollar's condition as in most posts regarding the dollar the focus is on the here and now which is where we make our money, but it is good to have perspective of history as well. 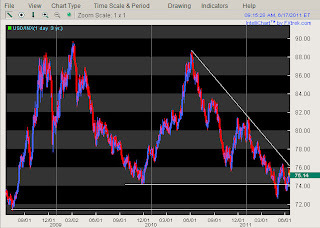 The chart below is a 30 year chart of the dollar. If I had the data I would display for you a chart of the Dollar that extends back to 1913 when the FED was founded and you would be able to see the debasement of the Dollar over that multigenerational period. Since 1913 the Dollar has lost 95% of its purchasing power. Isn't one of the FED's mandates price stability? In the price stability department I would have to say the FED has failed completely. Looking at the 30 year chart one could make an argument that the period we are in now is very similar to the period between the first peak in the dollar and the second one. Can see that argument and understand the logic behind it if you are only looking at this from a pattern perspective. To me the difference is the economic and fiscal backdrop was completely different at the last two peaks and the current situation is much more tenuous given the debt, deficit and the lack of will on the part of our leaders to make the hard choices. So could the Dollar rally and create another peak like the prior one in 2002? I guess it is possible but with out an economy that is truly growing and producing jobs and standing on its own without stimulus or FED intervention I believe that it is unlikely. We have yet to address all the missallocations of capital and all the excessive public and private debt and until we as a nation start on the path back to fiscal sanity I don't believe we will see a sustainable rally in the dollar.﻿ We don't have to solve all our problems over night but we do have to get back our credibility in the finacial markets and all the QE , stimulus and half baked spending tax plans are not going to do it, instead the sooner we bite the bullet and start doing the right things the sooner America can wake up from this nightmare. Unfortunately I just don't see this happening until after the 2012 elections at the eariliest, nor do I believe that Joe "three letters - J-O-B-S" Biden can control the debt ceiling situation, instead we face a rocky period. Winston Churchill once quipped, "You can always count on Americans to do the right thing - after they've tried everything else." I believe Churchill was correct in his observation and it still holds true today. For these reasons, I am personally using any dips in Precious Metals to average in because I believe that in the not to distant future the Dollar will be lower and Precious Metals higher.